Karlessi from the Italian research group Ippolita talks about the increasing data production of web users and how we contribute to measurement systems and the dissemination of real-time dataflows often discussed in terms of big data. 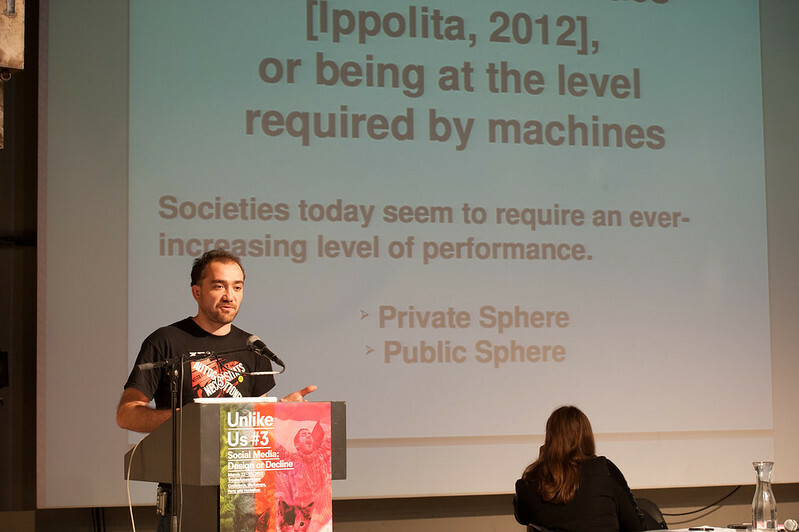 He argues that big data is not only produced for “Big Brothers” but that the act behind the production of this data, for example tweeting, liking, sharing and commenting have become rituals inscribed in the mediation of sociality by platforms. For Karlessi the ritual recalls the flow of water where a rite is something that flows, changes but also repeats itself in proceeding. These repeated practices can become rituals of interaction to “make things happen” in a relatively predictable manner. Such procedures, for example established rituals, are structured in a predictable manner and therewith are the very means to control crowds. In Crowds and Power (1960) Canetti describes how we do rituals to avoid open crowd eruption whereas in Religion for Atheists (2012) Alain de Botton discusses rituals as a way to organize communities (in both religious and secular states). In secular societies we still have many rituals and the inscribed mechanisms within social media platforms. Karlessi jokes how it’s very good and convenient to be Catholic on Facebook: you can just stand on the stage and explicate all your emotions where the platform records your confessions without the need of a pries. In such post-secular societies religious rituals don’t disappear at all but they are transformed and often replaced by personal and social rituals that are mediated such as liking. Social network accounts can be seen as ritualized spaces as personal belongings and habits are more and more mediated by digital devices. These habits become the rites of Religion 2.0 and are transformed by the sociotechnical assemblage of software, databases, algorithms and users. Algorithms are the rhytms of the online liturgy as the rites are inscribed and acted upon very often without the conscious interaction of users, or as Waldbillig describes it: “These unconscious algorithmic rituals practiced en masse become the form and function of online liturgy, or public worship, to the unconscious – presumably leading to the title of today’s talk “Minds Without Bodies”. The various forms of interaction that are becoming increasingly technologically mediated that are devoted to and developed by algorithms are carried out via directed social networks.” Karlessi describes how you don’t know how the algorithm works but “it works” and algorithms such as PageRank, EdgeRank, GraphRank and Amazon Recommendations make particular things happen. We are under an algorithmic authority that is deeply inscribed in our daily habits, including mediated rituals online, and the way out of this new control mechanism for Karlessi is to transform our rituals into new ones not governed by capitalistic social media platforms. See also: Karlessi from Ippolita – Minds Without Bodies: Rites of Religions 2.0 by Kimberly Rose Waldbillig at the Institute of Network Cultures blog.